Each season throws new challenges our way in gardening, whether its dealing with a long wet winter or severe summer drought. This year our biggest challenge has been battling the ferocious wind on the nursery, not only does it decimate blooms but it dries and crisps even the most robust plants. Our new location at Woottens is very exposed to the wind and we’re gradually devising methods of sheltering plants starting with erecting a ‘shade tunnel’ to protect our collection of Hostas, ferns and woodland perennials. We’re also planning to create a tall grass screen using fast growing Miscanthus to protect plants from wind exposure and weed seed from neighbouring fields. But as well as constructing shelter it’s wise to choose plants selectively for exposed gardens, there are some stalwart plants available that are undisturbed by heavy winds and hold their own whilst our Paeonias, Delphiniums and Irises are battered to the ground! After attending many windy shows last year, and taking part in planting the town roundabouts for Halesworth in Bloom, we’ve discovered some plants that are surprisingly resistant to our breezy climates, and salty roads, below are just a few. 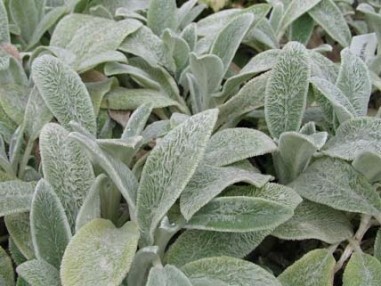 Stachys byzantina – Commonly known as ‘lambs ears’ due to the downy soft leaves. A handsome foliage plant that produces a lovely carpeting effect. 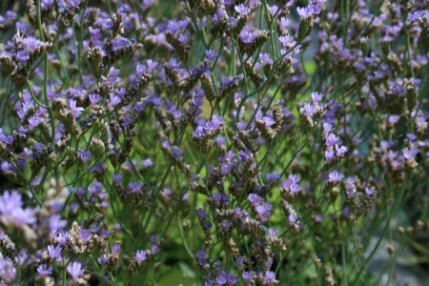 This species is tolerant of wind, salt and thrives in exposed areas with poor soil. The cultivar ‘Big Ears’ produces spires of silvery pink flowers whereas my favourite, S. byzantina Silver Carpet hardly gives us a bloom all year in this country, but they are not missed as the foliage takes centre prowess. 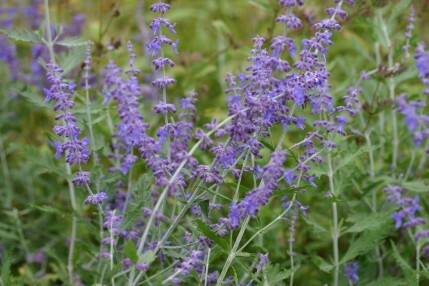 Perovskia – Russian Sage. A member of the highly scented Lamiacae family. Distinguishable but the aromatic foliage and square stem structure. 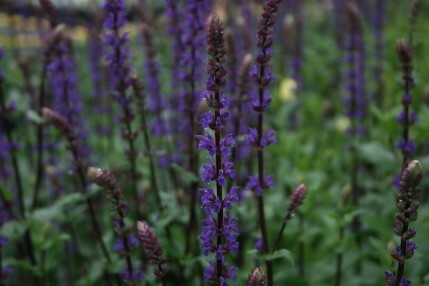 Other family members include, Salvias, Lavender, Agastache and Nepeta. Perovskia are native to the gravel screes of Afghanistan and Pakistan and thrive in poor soil and exposed areas. Blue Spire is a particularly good variety growing to 120cm in height and giving a strong architectural presence in a gravel garden. Helleborus argutifolius and other robust species – Often when we say ‘Hellebore’ our minds instinctively conjure up the image of Helleborus orientalis – the shade loving form with shy pendula blooms in pinks and whites or the rich black and red cultivars. However there are many more species of Hellebore that are much more forgiving in form and keen to flower for longer periods. In the depths of winter when many herbaceous plants have died back our Hellebores get the brunt of the winds but many evergreen species withstand such conditions with ease. H. argutofolius (syn. H. corsica) is one such plant, thick green leaves with a deeply toothed edge remain undamaged all winter. Plants produce clusters of lime green flowers. Helleborus x sternii is a similar form that has red stems and green blooms flushed with pink. 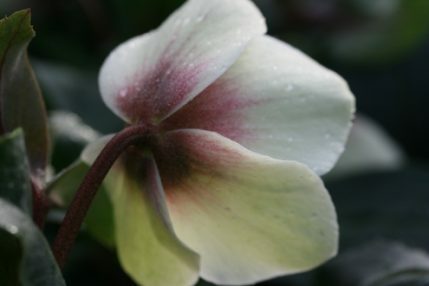 The traditional Christmas Rose or H.niger is another easy robust form that loves the sun, although rarely flowers at Christmas! Hybrids of these alternate species have proved very successful as good garden plants. Helleborus x nigercors Emma is one of the best forms, one of a few species crosses, H.argutifolius x H. niger. Tolerant of any and all winter weather, snow, ice wind and rain. Plants flower profusely from November-March. H. x ericsmithii also produce strong handsome evergreen hybrids. I think what’s important to note is that although we may want to grow certain plants we have to adapt to the environment we’re given and choose plant that will thrive and reward us with strong growth and full blooms. So if you do suffer with an exposed garden make sure you make accurate plant choices and where possible create shelter either through hedging or screening.